Leprecan'ts Win Pot O' Cash! 2nd Annual St. Patrick's Day Parade was twice as big as last year! Make a Splash in 2017! 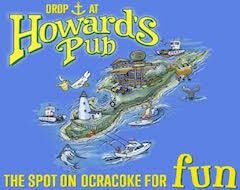 How do you begin the new year on Ocracoke? By running head first into the cold, cold ocean, of course! Ocracoke's seafood heritage was on display in the winter sun. Or, local Methodist guru wanders into literal goo. Hospitality workers on Ocracoke rarely get two days off in a row over Labor Day weekend. One your mark, get set, dance for the Summer Reading Program! Team Ocracoke Wins the Gold! Everyone's a winner on Ocracoke! Wrestles With Bears is the 2016 Women's Arm Wrestling champ! Meet some of the Festival's furry, four-legged friends. Meet some of the folks who attended Ocracoke's festival.